Symposium in Los Angeles brought together women leaders from the United States and Japan to share ideas and network. The symposium offered attendees a day of educational programs, leadership seminars and keynote speakers addressing "bridge building" from three points of view: Leadership, Diversity and Culture, and Business/Economic Opportunities. Global Organization for Leadership and Diversity (GOLD), an organization dedicated to developing global women leaders, recently held a successful symposium in Los Angeles. Held at the New Otani Hotel and Garden in Little Tokyo, the landmark event brought together leaders from the United States and Japan. The symposium entitled "21st Century Women Leaders: Building Bridges Across the Pacific" brought together nearly 200 women and men from corporate, business, academic, non-profit, and entrepreneurial backgrounds from both countries. The symposium offered attendees a day of educational programs, leadership seminars and keynote speakers addressing "bridge building" from three points of view: Leadership, Diversity and Culture, and Business/Economic Opportunities. "GOLD reaches women on both sides of the Pacific and fosters their professional growth," said Hiroko Tatebe, founder and executive director of GOLD. "The symposium is the first in a succession of initiatives GOLD will develop to provide leadership development training and experience that inspire and prepare women to assume leadership roles in a global diversified workforce environment." Speakers and panelists included accomplished leaders in all areas of business, academia and non-profit including Sumiko Iwao, Ph.D., Social psychologist, Professor Emeritus Keio University; Debbie Howard, President, Japan Market Resource Network, Chair and past President, The American Chamber of Commerce in Japan; Jack Kyser, Senior Vice President and Chief Economist, Los Angeles County Economic Development Corporation; Cathleen Benko, High technology industry Leader, Deloitte Consulting, National Managing Director, Initiative For the Retention and Advancement of Women, Deloitte & Touche USA, LLP; Patty DeDominic, Entrepreneur, Founder, PDQ Careers Group of Companies; Tracey C. Doi, Group Vice President and CFO, Toyota Motor Sales, U.S.A., Inc.; Irene Hirano, President & Chief Executive Officer, Japanese American National Museum; Yuko Kaifu, Former Consul, Consulate General of Japan, Los Angeles. "Hiroko Tatebe's vision and dedication to building bridges with the U.S. and Japan through women's leadership is an inspiration to all of us," said mistress of ceremonies, Tritia Toyota. "I am proud to be a part of this important event and encourage each attendee to continue participating and sharing Hiroko's vision with others." Diversity, inclusion and bridging were major themes of the Symposium. According to Price M. Cobbs, M.D., president and CEO, Pacific Management Systems, "the vision of Hiroko Tatebe resulted in a groundbreaking GOLD Symposium in Los Angeles. This partnership of women from Japan and America will become a powerful force for diversity and inclusion in both countries." Attendees of the Symposium agreed with Cobbs and left the symposium feeling inspired and informed. Asked to evaluate the event, 100% of the evaluation participants noted they would recommend the Symposium to a colleague. With an average rating of 4.56 out of 5 overall for meeting or exceeding expectations, Symposium attendees from both the U.S. and Japan felt their day was well spent at the event. Comments from participants included "Excellent Speakers", "Inspiring", and "Perfect!" Vivian Shimoyama, president, Breakthru Unlimited, said "(the Symposium) was clearly a way to start a dialogue and get people to continue their work together." Tomoko Yamaguchi MD, Ph.D., vice chair, Minami Yachimata Mental Hospital, Japan, felt that the "sessions were well organized, diverse and well covered in terms of transpacific business relations." Tatebe recognized the numerous sponsors and partnering organizations for their support of the organization and the symposium, "GOLD is grateful to those who have generously helped make this symposium a reality." Johnson & Johnson; Hitachi; IBM; Merrill Lynch Japan Securities Co., Ltd.; Toyota Motor Sales, U.S.A. Inc.: American Honda Motor Co., Ltd.; Canon U.S.A.; Goldman, Sachs & Co.; Southern California Edison; NPO GEWEL, Japan; Union Bank of California. 21st Century Leadership Development Study Tours Exchange opportunities, starting with bringing women graduate students from Japan to Los Angeles for an intensive leadership education program designed through a collaboration with LEAP (Leadership Education for Asian Pacifics, Inc.). In subsequent years, the Study Tour may expand to include U.S. - Japan exchanges for entrepreneurs and early-career women executives. 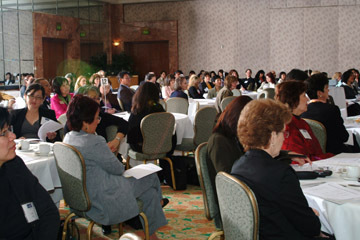 The Leadership Development Study Tour will be held in Los Angeles this year August 12-17, 2007. For additional information on GOLD and the symposium please visit http://www.goldleaders.org. GOLD is currently under the fiscal sponsorship of Community Partners' Incubator Services. Community Partners is a 501(c)(3) nonprofit organization which accelerates ideas into action for the public good.